Our unbeatable range of Speedrite electric fence energisers gives you all the fencing power you need without burning a hole in your pocket - along with the best in quality, design and reliability. All have a two-year warranty, and can be returned to us for servicing. We will also replace any energiser with 24 hours in the event of a failure. But we're confident that won't happen often - New Zealand-based Speedrite has been manufacturing energisers for over 60 years, designing them for some of the toughest conditions on earth. Choose from battery energisers for remote locations, mains energisers for fences near and mains supply, and dual power energisers for when you want the versatility of both. Battery energisers offer the most versatile option for remote areas where you can't connect the electric fence to a mains supply. Available in a two sizes to suit different fence lengths and stock requirements. Please note that batteries are not included. Welcome to the new generation of dual power energisers for electric fencing, offering the best of both worlds - all the versatility of a battery energiser for remote locations, with the economy of a mains energiser when you're closer to home. Just hitch them up to a 12-volt rechargeable battery (not supplied), or plug them into the 240v main supply. It's your choice. Speedrite's new integrated solar fence energisers, with their touch monocrystalline panels, are designed to deliver high performance, even the UK's low sunlight conditions. Ideal for strip-grazing in remote areas, their unique mounting brackets attach easily to steel or timber posts. These solar panels using the latest in crystalline silicon technology to capture the sun's energy and convert it into electrical current - more efficient than amorphous or thin film solutions, particularly in the lower light conditions found in the UK. Accredited with the internationally recognised IEC 61215 certification. 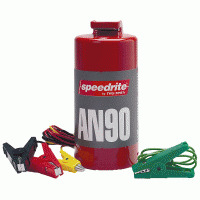 Ideal for all kinds of electric fencing.